So how old is the Boston Mini Marathon really? I've been trying to come up with a list of all the winners of the Boston Mini Marathon. The project started after the 2010 race, and I spent a few minutes looking up the easy years, 1998 to 2010. After that I put away the list and forgot about it. There was no hurry; so far as I knew I was the only one who cared. This was entirely unexpected. If the 2011 race was really the 32nd annual Boston Mini Marathon, then 1980 would have been the first race. But this Waycross Journal-Herald article indicates that the Mini actually started in 1979. Unless someone skipped a year along the way, the 2011 race was actually the 33rd Boston Mini Marathon. Of course, this discovery just creates more work. Now the age of the race is in question, and the 1979 newspaper article carelessly omits the name of the top woman finisher. You know, it may be time to shelve the list for another twelve months. The work won't be any easier in a year, but with any luck I'll have forgotten about it entirely by then. e-mail to hwills@gmail.com, or leave a comment below. 2011 Boston story, "Sullivan and Rosen smokin' at the Boston Mini"
2010 Boston story, "Molosky makes it two-in-a-row at the Boston Mini"
2009 Boston story, "Another Boston Mini Win For Rosen"
On every approach to Boston, Georgia on US 84, you'll find a sign saying, "Welcome to Boston. Visit our Historic Downtown." Appended below that, you'll also read, "Boston Mini Marathon. Last Saturday in October." Now that's civic pride. That other Boston, up in New England, doesn't tout its Patriot's Day marathon to motorists that way. In Massachusetts, they probably think that they have other things to be proud of rather than a footrace. Probably something having to do with early American history. Certainly not the Red Sox. Each year since 1980, the Georgian Boston has unashamedly hosted it's half-marathon, always on the same out-and-back course on the Old Dixie Road. Only the cows in the pastures along the way have changed. Well, the pavement has gotten noticeably older over the years. If the cracks get any wider, the race will have to be advertised as a trail run. In 2011, though, the road was still more or less intact and the cows in the fields were ready to watch some racing on Saturday morning, Oct. 29. Kevin Sullivan of Capital City Running and Tallahassee's Vince Molosky, the event's defending champion, set the early pace. The pair ran together for the first two kilometers, much as they had three weeks earlier at the Pine Run 20K. This time, though, Sullivan broke away much earlier, pulling ahead of Molosky on the third kilometer. By seven kilometers Sullivan was up by 200 meters, running strong. At the halfway turnaround on the 11th kilometer the margin had increased to nearly 800 meters and Sullivan was still running strong. When Sullivan returned to downtown Boston and the finish line he was two kilometers ahead of Molosky, clocking 69:29 for the half marathon--the fastest time in at least the last 14 years of the 32-year old race. Molosky finished runner-up in 76:50. Behind Molosky, Jay Wallace finished in third place as the top master, running 77:31. After finishing as the top woman at the Boston Mini four straight years from 2006-2009, Sheryl Rosen missed the 2010 race. But she was back in Boston in 2011. Darting out ahead of the rest of the female field almost immediately after the start, Rosen led the entire race, clocking 82:10 for the half-marathon distance--her fastest Boston Mini yet. Some 1800 meters back, runner-up Seeley Gutierrez was finishing up a 90:02 performance. Tallahassee's Micah Adriani was the third woman in, running 93:37. The fastest woman master of the morning was Tallahassee's Mary Vancore, sixth among the women with a 99:05. 2010 story, "Molosky makes it two-in-a-row at the Boston Mini"
2009 story, "Another Boston Mini Win For Rosen"
More than a few people wore costumes in the Tallahassee YMCA's sixth annual Trick Or Trot 5K in Southwood on Friday evening, 28 October 2011. Some people came as Batman, or as a Dr. Seuss character, or a Disney character, or a pirate, or a monster, or an animal. Caleb Carmichael didn't wear a costume, but he came as his competitors worst nightmare. Carmichael, a University of West Florida assistant cross-country coach, jumped out into the lead and then got farther and farther ahead, ultimately winning by nearly 400 meters in 16:27. Grady Smith was a distant second in 17:49, followed by Peter Kaus in 18:13. Jay Silvanima was the top male master in the field, placing 8th overall in 21:16. The top master and the top finisher were one and the same in the women's division, with Tallahassee's Nancy Stedman placing 13th overall in 22:18 to finish as the first female. Florida State University School cross-country runners Savana Osterbye and Sydney Earp ran 23:39 and 23:57 to finish as the second and third females respectively. Less than two hours earlier, Osterbye and Earp had each run a 5K cross-country race with the FSUS team on the north side of town. Some people just don't know when to stop. The sixth annual Trick-or-Trot 5K was run on a USATF certified course (FL10091EBM) through Tallahassee's Southwood community. In previous years the race had been held on a Saturday morning; this time around it was run on a Friday evening with a 6:00PM starting time. The change didn't seem to hurt race attendance at all. Know any of the missing winners? Please contact me! When it comes to the GHSA Region 1-AA cross-country meet, Thomasville High needs to remember to bring their uniforms, their racing shoes, and their brooms. The Bulldogs made a clean sweep of the meet for the second year in a row at Pebble Hill Plantation south of Thomasville, Georgia on Wednesday morning, 26 October 2011. Behind sophomore Mareika Haaren's winning 23:19, the Thomasville girls team won the region title with a near-perfect 17 points, taking the first four places in the five-kilometer race. In the boys' race, Thomasville's Grif Rutherford successfully defended his 2010 Region title with a 17:40 win, leading his team to victory with 40 points. It was a clear morning with moderate temperatures, beautiful conditions to showcase the beautiful Pebble Hill venue. The girls ran just after 10:30, the start somewhat delayed by the late arrival of the Albany team. A trotting horse pulling a sulky guided the runners around the course. After a circuit of the meadow where the race started, Thomasville's first four runners were at the front of the field, led by Kara Meng. Meng continued to set the pace through two kilometers, but during the third kilometer Thomasville's Mareika Haaren took over the lead, opening up a six-second margin. Meng never lost contact, though, and closed the gap over the final two kilometers. At the finish line it was Haaren over Meng, but only by a single second, 23:19 to 23:20. Defending Region champ Rosalie White was third for Thomasville in 23:55. Emma Fennelly (4th, 25:25) and Samantha Clark (7th, 25:12) completed Thomasville's scoring, giving the Bulldogs 17 points and the win. The victory qualified Thomasville to run in the state championships in Carrollton on 5 November 2011. The top four teams advance out of the Region, so Albany (2nd, 53), Cook County (3rd, 88), and Early County (4th, 96) would be joining Thomasville in Carrollton. The boys' 5K race immediately followed the girls'. The horse-and-sulky had vanished, but the boys followed a Gator around the course. Mostly, though, they followed Thomasville sophomore Grif Rutherford. Rutherford was leading right after the start, chased by Fitzgerald senior Pedro Martinez. Rutherford continued to pull away, though, and ended up winning more than 150 meters in 17:40, 48 seconds faster than he ran at the 2010 Region 1-AA Meet. Martinez hung on to second, running 18:17. Including Rutherford, Thomasville put three runners in the top ten, setting up a 40-point total--good enough to defend their 2010 Region title. Fitzgerald took second with 69 points and Cook County third with 74, each team joining Thomasville in qualifying for a trip to the state meet in Carrollton. For the fourth spot, though, Early County and Berrien County each had 100 points. The tie-breaker was the sixth runner on each team. It was close. Early County's sixth runner placed 38th, and Berrien's 39th, less than eight seconds apart, but enough to send Early County on to Carrollton, ending Berrien County's season. 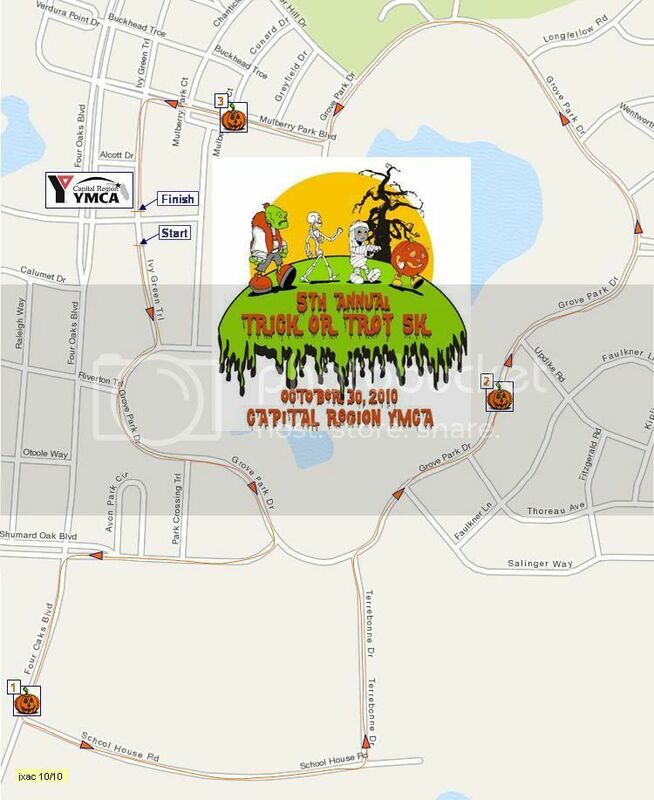 YMCA Trick or Trot 5K and one-mile fun run. 5:30pm ET one mile / 6:00pm ET 5K. YMCA at Southwood, 3196 Merchants Row Blvd., Tallahassee, Florida 32311. Entry form and flyer. Tasha Everette, teverette@capitalregionymca.org or 850-701-0461. 32nd annual Boston Mini-Marathon. 8:00 am ET. Commercial Bank, 124 West Jefferson Street, Boston, GA 31626. 2010 story. 2009 story. Brad Johnson, bradjohnson@bankcb.com or 229-498-8500 (day) / 229-226-4679 (evening). Second annual Halloween Hustle 5K. 8:00AM ET. Maclay Gardens State Park, 3540 Thomasville Road, Tallahassee, Florida 32309. Event web page. Entry form and flyer. 33rd annual Tricker Trek 10K and one-mile fun run. 8:00am CT 10K / 9:30am CT one mile. Marina Civic Center, 8 Harrison Avenue, Panama City, Florida 32401-2724. USATF certified course FL90031DL (10K). Online registration at active.com. Gumby Weckherlin, 850-271-5896, or Joe Edgecombe, joeruns@yahoo.com or 850-774-0018. Spooky 5K and 1-Mile Fun Run. 9:00AM CT. Fort Rucker Physical Fitness Center, Building 4605 Andrews Avenue, Fort Rucker, Alabama. 334-255-0308. Race to Rescue Bainbridge-Decatur County Humane Society 5K and one-mile fun run. 8:00AM ET. Nature trail, Earl Maye Boat Basin Park, Bainbridge, Georgia 39817. Event web site. Entry form and flyer. Nicole Touchton, info@racetorescuebdchs.com or 229-254-3371. Eighth annual St. John Road Race 5K, 1 Mile, and Tot Trot. 8:30 am ET (5K), 9:30 am ET (1 Mile), 9:45 am ET (Tot Trot). St. John Catholic School, 800 Gornto Road, Valdosta, GA 31602-1699. Entry form and flyer. Online registration at RunSignUp.com. 229-244-2556. Flagler College Tallahassee Run For The Books 5K. 9:00AM ET. Entry form and flyer. Online registration at RaceIt.com. Karen Atkinson, atkinsok@tcc.fl.edu or 850-201-8070. Sixth annual Valdosta State University Turkey Trot 10K. VSU Student Recreation Center, 1300 Sustella Ave. Valdosta, Georgia 31698. Online registration at valdosta.edu. Ironman Florida (2.4 mile swim, 112 mile bike, 26.2 mile run...duh!). 6:50am CT first wave. Boardwalk Beach Resort, 9400 South Thomas Drive, Panama City Beach, Florida. Event web site. Florida State Employees Charitable Campaign 5K. 8:30AM ET. Southwood State Office Complex, 4075 Esplanade Way, Tallahassee, Florida. 2010 story. 2009 story. Course map. Entry form and flyer. Tim Unger, UngerT@dor.state.fl.us or 850-617-8832; or Alison Dodson, Alison@uwbb.org or 850-487-2087. Veteran's Day 5K. 8:00AM ET. Vietnam War Memorial, Monroe Street at Apalachee Parkway, Tallahassee, Florida. Event web page. Entry form and flyer. Online registration at active.com. Joe West, comedyjoe@netzero.com or 850-212-2587. Bainbridge-Decatur County YMCA Veteran's Day Classic 10K. 9:00am ET. Bainbridge College, 2500 E Shotwell St, Bainbridge, GA 39819. 2010 story. USATF certifed course #GA98012WC. Liv Warren, LivWarren@hotmail.com or 229-243-0508. Almost World-Famous YMCA Holiday Chili Run 15K / 5K /one-mile fun run. 7:45 am ET one mile / 8:30 am ET 15K and 5K. Albany YMCA Central Facility, 1701 Gillionville Road, Albany, Georgia 31707. Entry form and flyer. dwallace@albanyareaymca.org or 229-436-0531. 17th annual Draggin' Tail 18-Mile Run, Relay, & 5K. 8:00 am CT. St Theresa's Catholic Church, 2056 Sunny Hills Boulevard, Sunny Hills, FL. 2010 story. Online registration at active.com. Marty Kirkland 850-265-8439 or Joe Edgecombe joeruns@yahoo.com or 850-763-5005. Third annual United Way Community 5K and one-mile fun run. 9:00am ET. Southside Elementary School, 491 3rd St SE, Cairo, Georgia 39828-2796. Entry form and flyer. Andrea Bentley, a_m_bentley@yahoo.com or 229-403-9075. Suwannee County School Board Wellness Initiative Turkey Trot 5K. 8:00AM ET. First Federal Sportsplex, 1201 Silas Drive, Live Oak, Florida. Entry form and flyer. Online registration at active.com. Kathy Wood, wellness@suwannee.k12.fl.us or 386-364-4700. Wild Hog Jog 5K and Chicken Crawl one mile. 9:00AM CT. Gulf Coast State College, 5230 West Highway 98, Panama City, Florida. Event web site. Online registration at active.com. Kris Retherford, k.retherford@retherfordcontracting.net or 850-527-2861. Marlin Athletic Fitness Challenge 5K. 4:00PM CT. Arnold High School Football Field 550 Alf Coleman Road Panama City Beach, Florida. Online registration at active.com. MCLB Turkey Trot. 9:00AM ET. Golf Driving Range, Marine Corps Logistics Base Albany, . Entry form and flyer. Online registration at active.com. Valdosta Thanksgiving Day 5K. 8:00am ET. Get Active Running & More, 3200 North Ashley Street, Valdosta, Georgia 31602. 2010 story. Online registration at runsignup.com. Get Active Running & More, 229-219-0010. Winterfest 5K. 4:30om ET. Get Active Running & More, 3200 North Ashley Street, Valdosta, Georgia 31602. 2010 story. Online registration at runsignup.com. Get Active Running & More, 229-219-0010. Run for the Redfish Half-Marathon / 5K / one-mile fun run. 8:00am CT. Pier Park, Margaritaville, 16230 Front Beach Road, Panama City Beach 32413. 2010 story. Event web site. Online registration at active.com. Jingle Bell Jog 10K / 5K / One-Mile. 8:00am ET (10 km) / 9:00am et (5 km). Tift Park, Corner of 5th and Monroe, Albany, GA 31701. 2010 story. USATF certified courses GA05018WC (10 km) and GA05017WC (5 km). Event web site. Online registration at active.com. Junior Service League 5K Reindeer Race and one-mile Santa Shuffle. 8:00am CT. Panama City, Florida. Online registration at active.com. Lynn Haven Centennial 5K. 7:30AM CT. Lynn Haven Library (Sheffield Park), 901 Ohio Avenue, Lynn Haven, Florida. Online registration at active.com. 28th annual Bowlegs 5K Run for Scholarship. 9:00am ET. FAMU / FSU College of Engineering, 2525 Pottsdamer Street, Tallahassee, Florida 32310-6046. USATF certified course #FL95008DL. 2011 story. 2010 story. Larry Giunipero, lgiunip@cob.fsu.edu or 850-878-5569, or Bill Hillison, bhillis@garnet.acns.fsu.edu or 850-893-4557. 8th annual Kiwanis River Run 10K / 5K. 9:00am ET. Earle May Boat Basin, 100 Boat Basin Circle, Bainbridge, Georgia 39817. 10K is on USATF certified course GA05001WC. Lance Wilson, lance.wilson096@cottonstates.com or 229-400-5854. Third annual FSU Krispy Kreme Challenge. 9:00am ET. FAMU / FSU College of Engineering, 2525 Pottsdamer Street, Tallahassee, Florida 32310-6046. 2011 story. 2010 story. Suzanne Berkey, smb07h@fsu.edu or 727-459-8597. David Altmaier was the first to finish Tallahassee's 13th annual Sundberg Memorial 5K, running 17:05 for the 3.1-mile race through Maclay Gardens State Park on Saturday, 22 October 2011. Runner-up and fastest master finisher Carl Nordhielm finished nearly 200 meters behind Altmaier in 17:47. The first female finisher was Tallahassee schoolteacher Lisa Johnson, who placed sixth overall in 18:49, just eleven seconds shy of the women's record for the Sundberg 5K. For the third year in a row, defending champion Nancy Stedman was the first woman master, this time placing 30th overall in 22:22. Over the years there has been a proliferation of races on the Maclay Gardens course. This year alone, in addition to the Sundberg 5K, the Marzuq Shrine Mothers Day 5K was run in Maclay, as was the Fallen Heroes 5K and the running portion of the Red Hills Triathlon. The Halloween Hustle 5K is scheduled in the Gardens just seven days after the Sundberg on October 29. The Sundberg, though, is senior to all those races, having been run in Maclay since 1999--far enough back that the course had to be changed when the park entrance was re-aligned several years ago. And the race memorializes Alan C. Sundberg, who worked at Maclay Gardens State Park. Maclay is more than just a convenient venue for the Sundberg 5K. As always, the race started in the Lake Hall recreation area. Altmaier dashed away from the lake ahead of the field, chased by Raa Middle School cross-country runners Evan Francis and James Dodson. A kilometer into the race, though, Francis and Dodson had fallen back. Master runners Carl Nordhielm, Tony Guillen, and Myles Gibson were leading the pursuit of Altmaier. Nordhielm and Guillen dropped Gibson on the trail section in the middle of the race. With a kilometer to go they were no threat to Altmaier but there were still master honors to fight over. While Altmaier went on to a 17:05 win, Nordhielm pulled away from Guillen to take the master title, 17:47 to 18:02. Gibson held on to fourth, holding off Cole Tessier 18:40 to 18:47. Lisa Johnson led the women from wire to wire, running eleven seconds faster than her winning time seven days earlier in the Conley Yellow Jacket Swarm 5K. Women's runner-up Brandi Campbell was almost 400 meters back in 20:21. 2011 Sickle Cell 5K champion Tiffany Barz was the third woman finisher, placing 23rd in 21:09. After winning the women's division in 2010, Nancy Stedman was the fourth woman finisher in 22:22, and had to be content with finishing as the first woman master for the third straight year. 184 athlete finished the 2011 Sundberg 5K. The race benefits the Florida Skin Cancer Foundation. 2010 story, "Jay Smith and Nancy Stedman take the 2010 Sundberg titles"
2009 race story, "Mucchetti and Taylor grab wins at 2009 Sundberg 5K"
Spooky In The Park 5K. 9:00PM CT. Enterprise Recreation Complex, 1901 Neil Metcalf Road, Enterprise, Alabama. Event web page. Entry form and flyer. Tricia Hilbun, thilbun@cityofenterprise.net or 334-348-2683. 13th annual Alan C. Sundberg, Jr. Memorial 5K. 8:00 am ET. Maclay Gardens State Park, 3540 Thomasville Road, Tallahassee, Florida 32309-3413. 2010 story. 2009 story. Event web site. Event page on Facebook. Entry form and flyer. Bill Sundberg, bill@sundbergandhessman.com or 850-402-3000. Randolph County Crossroads Festival 5K Road Race and one-mile fun run. 8:00AM ET 5K / 8:30AM ET one mile. Cuthbert, Georgia. Event web site. Course map. Entry form and flyer. Online registration at active.com. Fourth annual Run Fun For A Cure 5K. 9:00am ET. Greenwood Plantation, Thomasville, Georgia. Event page on Facebook. Debbie Beeson, dmbeeson@archbold.org or 229-403-9016. Second annual “Running for the bay!” Marathon, Half Marathon, 10K, 5K and 50K ultramarathon. 7:15am ET. Apalachicola, Florida. Race web site. Online registration at active.com.